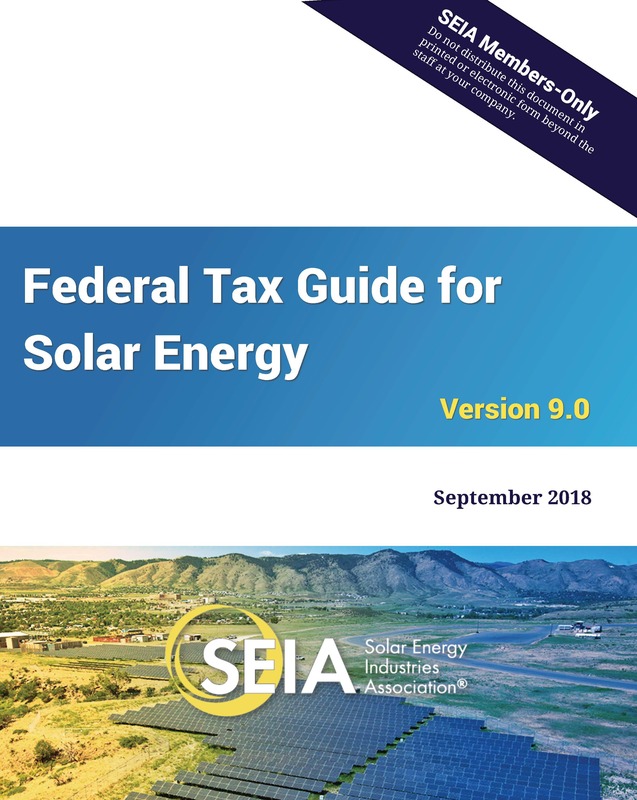 The SEIA Federal Tax Guide for Solar Energy is a regularly updated resource created to guide you and your customers through the federal tax benefits for solar. This detailed guide is a SEIA members-only benefit. Learn more about becoming a SEIA member. Version 9.0 is the first comprehensive update of the SEIA Solar Tax Manual since 2016. It is a comprehensive rewrite of the guide to incorporate new IRS guidance (including construction-start rules for solar projects, various private letter rulings to solar companies and final regulations on what parts of a solar project qualify as "real property" for REIT purposes), reflect the effects of the "Tax Cuts and Jobs Act" enacted at the end of 2017 (including a new 100-percent depreciation bonus, new limits on interest deductions, changes in the tax treatment of prepaid power contracts and government grants, a new base erosion anti-abuse tax that could affect tax credits, new rules for carrybacks and carryforwards unused tax benefits), add new sections on opportunity zones and special types of customers and customer arrangements (such energy savings performance contracts and "virtual" corporate PPAs) and update other parts of the guide (including on solar securitizations, Treasury cash grant litigation, DOE loan guarantees and US Export-Import Bank financing)..
SEIA’s Guide is authored by Keith Martin, Co-head of Project, Unites States at Norton Rose Fulbright US LLP. Edition 9.0 was released September 2018. This document is only to be used by SEIA member companies in agreements to which they are a party. Dissemination to clients, partners or other third parties for use in arrangements to which the SEIA member is not a party is forbidden. The documents and descriptions linked to or provided on this page are provided for informational purposes only and do not constitute legal advice. Consult with legal, tax and accounting professionals before using the information and documents provided on this page. The documents should not be construed as legal advice for any particular facts or circumstances. These documents and descriptions were prepared as the result of work sponsored by SEIA. They do not necessarily represent the views of SEIA or its employees or members. SEIA, its employees, contractors and subcontractors make no warranty, express or implied, and assume no legal liability, for the documents and descriptions.